Guess what color I’m going to felt? Very interesting seeing how different fibers ( wool bat, wool prefelt, silk bombyx, silk hankies, silk gauze, alpaca yarn and raw curly cotswald wool) all took up the dye differently and created just what I wanted… subtle variations of hue. I only used Avocado and Sun Yellow acid dye. Another experiment was dyeing wool “nebs”-tiny little specks of raw wool that are the result of some step in wool processing. Lots of possibilities for those little buggers. So I tied them in a silk gauze bundle and threw them into the dye pot. Needless to say there were many escapees some of whom attached themselves to other pieces of fiber. I figure it just created even more opportunities for complex texture when I felt it (later this week)! This entry was posted on January 20, 2013 at 5:29 pm and is filed under Dyeing, Process. You can follow any responses to this entry through the RSS 2.0 feed. You can leave a response, or trackback from your own site. 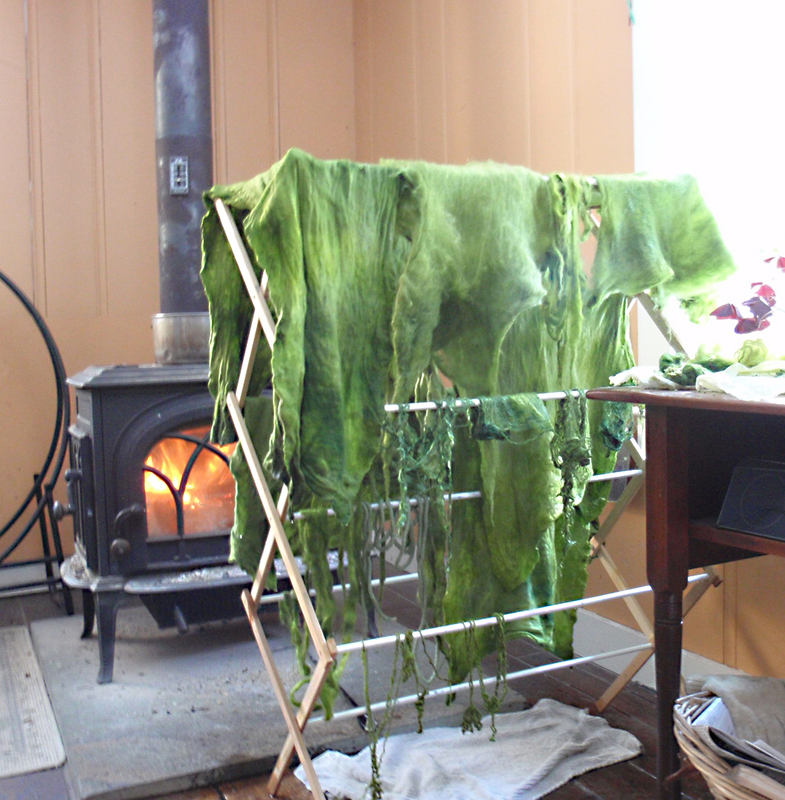 wow Karen , i love the green colour from avocado, how does this natural dye comes up on silk? Actually I use acid dyes on silk and wool. I’m sorry if my reference to “avocado” sounded like I dyed with it. I would love to learn more about natural dyeing but it’s hard to give up on the deep saturated colors I get from acid dyes!